More than 100 guests from government, academia and the accounting industry have come together to honour and celebrate the lifetime achievements of four new inductees into the Australian Accounting Hall of Fame. The eighth Annual Dinner and Awards Ceremony of the Australian Accounting Hall of Fame took place on Wednesday 15 March 2017. 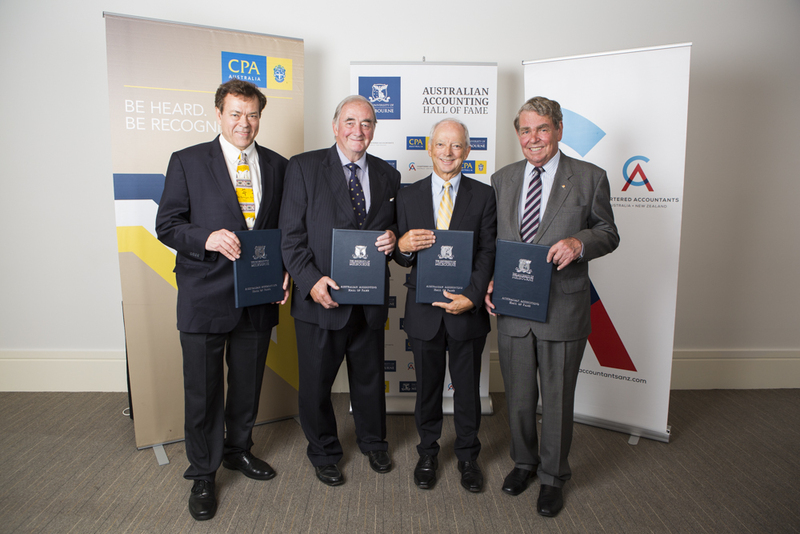 The Deputy Dean of the Melbourne Business School, Nasser Spear, was joined by the Head of the Melbourne University Department of Accounting, Matt Pinnuck, the Directors of the Centre for Accounting and Industry Partnerships - Brad Potter, Stewart Leech and Kevin Stevenson - and the Hall of Fame Director Phill Cobbin. (L-R) Professor George Foster, Mr David Brownell (representing his brother, Professor Peter Brownell, now deceased), Mr Warren McGregor and Mr John Bishop AO were inducted into the Australian Accounting Hall of Fame on Wednesday 15 March. Mr John Neil Bishop AO was honoured as a leading practitioner, standard setter and office holder. He studied economics at the University of Adelaide, progressing to Managing Partner of the Adelaide office of KPMG in 1980. He was appointed president of the Institute of Chartered Accountants in Australia in 1978 and served on a large number of committees at state and national level with the ICAA and joint committees with the ASA. In the 1980s Mr Bishop was Australia’s representative on the International Accounting Standards Committee (IASC), Chairman of the Organising Committee of the Australian Accountants’ Centenary Congress and the International Federation of Accountants (IFAC). He also served as a foundation member of the Australian Accounting Standards Review Board. During the 1990s Mr Bishop was appointed by the South Australian State Government to a number of key board roles. He has received numerous awards including Officer of The Order of Australia (AO) for services to the accountancy profession, Honorary Life Membership of the Adelaide Festival, Grand Officer of Merit (GOMLJ) by the Military and Hospitaller Order of St Lazarus of Jerusalem and a Meritorious Service Award presented by the ICAA. Professor Peter Brownell (1950–1997) was a researcher, author, mentor and champion of doctoral programs in accounting. His short but distinguished career in academia was founded on study at the University of Melbourne and the University of California (Berkeley) where he received his doctorate. His academic career began at the Sloan School of Management (MIT) and later at Macquarie University. Professor Brownell returned to the University of Melbourne in 1990 to lead the Department of Accounting as the Arthur Andersen Professor of Accounting, subsequently Ernst and Young Professor of Accounting, until his death in 1997. In a relatively short period Professor Brownell established himself as one of the leading international scholars in accounting, publishing more than a dozen times in prestigious journals. He produced ground-breaking work which considered the place of psychological perspectives in accounting information systems. Professor Brownell was committed to the wider academy and collaborated widely in the pursuit of knowledge and further understanding. He actively pursued the development of honours, masters and doctoral programs focusing particularly on research methods. His thoughts on doctoral education particularly, paved the way for the development of leading doctoral programs in Australia. Professor Brownell was represented at the event by his brother, Mr David Brownell, pictured above. Professor George Foster is a widely recognised and hugely respected researcher, author, educator and advisor. He earned his honours and masters of Economics at the University of Sydney in 1970, after which he undertook doctoral studies at Stanford University, where he is currently The Konosuke Matsushita Professor of Management. Prior to appointment at Stanford, Professor Foster was at the Australian Graduate School of Management and the University of Chicago where he wrote the first edition of his ground breaking text Financial Statement Analysis. His academic publication record is outstanding and includes more than 60 papers, 19 of which have appeared in premier accounting journals. His research, which has embraced financial reporting, capital markets, management accounting, entrepreneurship and sports business management, has been conducted with a wide list of collaborators. Professor Foster co-authored the sixth through tenth edition of the high-profile and widely prescribed Cost Accounting, A Managerial Emphasis. In the 1990s Professor Foster turned his attention to Entrepreneurship, producing multiple research papers. His expertise has been sought by policy bodies, regulators and government. He has maintained close contact with Australia throughout his career. He has received numerous prestigious awards including two honorary doctorates from European universities. Mr Warren McGregor was honoured as an eminent leader in thought and idea development in the production of accounting standards. Following a short period in academia at Monash University, he joined the Australian Accounting Research Foundation (AARF) as a project manager, which presaged a lifetime involved in the advancement of intellectual ideas that underpinned policy development and accounting standard setting. Mr McGregor was appointed to the inaugural board of the International Accounting Standards Board (IASB) where he served in a number of senior roles. He had strong involvement with standard setting at a global level. Mr McGregor led the efforts to engage not only with Europe and the European Commission but also the Financial Accounting Standards Board in the US and the Accounting Standards Board of Japan. He played key roles in encouraging Australia to transition to the international reporting framework at an early stage and helped to facilitate the creation of a regional voice in the IFRS development process through the establishment of the Asian-Oceanian Standard Setters Group. Mr McGregor provided the groundwork for the first international conceptual framework document enabling practitioners to analyse and report transactions for which an accounting standard did not exist. He continues to offer contributions on technical and other matters to the Australian and international standard setters through consulting to the Australian business community and as a principal of Stevenson McGregor. The Australian Accounting Hall of Fame acknowledges and thanks our valued sponsors, Chartered Accountants Australia and New Zealand and CPA Australia, whose generous support makes this prestigious event possible. Nominations for the 2018 Australian Accounting Hall of Fame awards will be open on 1 May 2017.